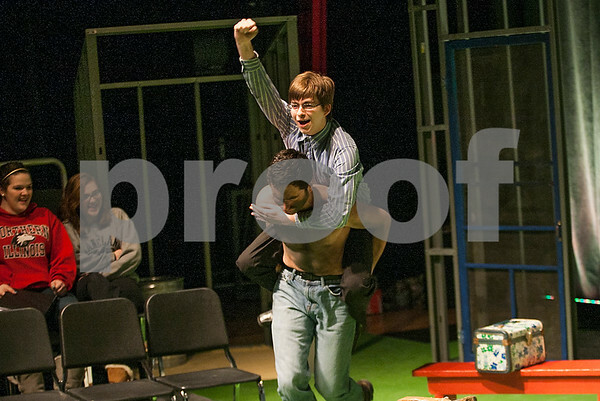 "Alan" played by Alex Bacceschi, a junior, rides "Hal Carter" played by Andrew McComb, a senior, like a lawnmower during a scene from Sycamore High School's dress rehearsal of the play "Picnic" by William Inge on Wednesday, Feb. 18, 2015. The play opened last night and also has shows tonight at 7 p.m. and Saturday at 7 p.m. There is an understudy show on Saturday at 2 p.m.
“Picnic” takes place in the combining yards of two middle-aged widows on Labor Day weekend in a small town in Kansas. Flo Owens, her two daughters, Madge and Millie, and a boarder school teacher live in one house while Helen Potts and her mother live in the other. Hal Carter, a young man who is trying to discover his place in the world, upsets the simple path Flo has laid out for her daughters.